One of the very best things about our San Francisco trip was the hotel. Hotel Vitale is a brand new building on the Embarcadero, close to the fabulous Ferry Building and with views of the Bay Bridge. Click to enlarge. For individual pics see Flickr. The building itself is no great shakes architecturally, it was panned when it opened and is so boring that I found I hadn't bothered to take any photos of it, but the interior design, by San Francisco-based design company McCartan is inspired. To a basic palette of naturalistic neutrals - limestone, wood, and textured fabrics in earthy browns, beiges and moss greens - the designers have added a pink plastic love seat; glamorous light fittings at every turn; nature photographs dotting the walls; a sprig of lavender above every door; adorable green velvet chairs; a gorgeous glass table lamp hanging from the ceiling; an amazing shrouded chandelier in the round bar; and lights in the corridors made of pressed flowers. The whole vibe was of easy relaxed glamour, just perfect for San Francisco. 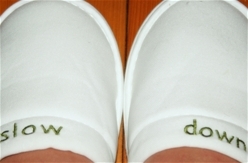 Even the slippers (which *blushes* I somehow seem to have acquired) were inspiring. 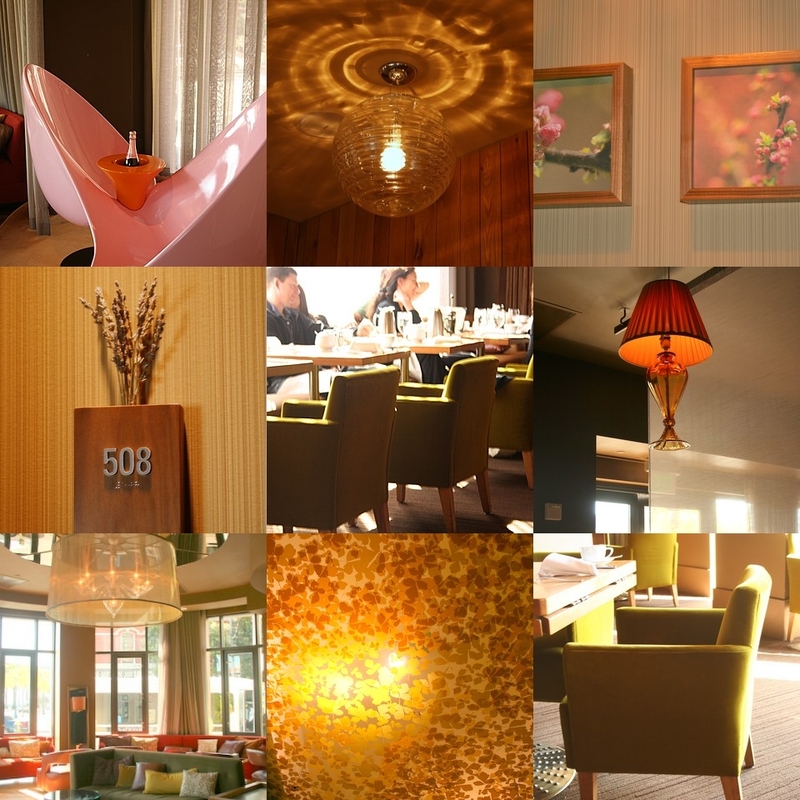 I like putting together collages of design details from groovy hotels. I find them a good way of getting a quick overview of the hotel's design concept and feel. Why not pay a flying visit to the Cotswold House Hotel , La Coluccia and the Chromata while you're here? I think you're meant to acquire hotel slippers...surely they don't pass them on to the next guest do they?!! I like that crazy ceiling light too! Hi Paola! My husband and I stayed at Hotel Vitale for our one-night stopover en route from Auckland to London back in January. As it was the last night of our trip, we'd splashed out a bit on a nice room with a view of the Bay Bridge, but when we arrived we were incredibly lucky to be upgraded to the penthouse suite. It was STUNNING! A gorgeous bedroom, a living/dining room and two lovely bathrooms - plus an enormous terrace just for us...it was such a lovely space to be in and so very well designed. Wow Joanna - that sounds A to the AMAZING. We had a room with a view over the Bridge but your view must have been incredible. And a bathroom each sounds most unnecessarily decadent. Love those slippers. Would be great on Mirror Mirror.